It’s not really fair if our dogs and cats get mixed messages from their family about what is or is not acceptable behaviour. 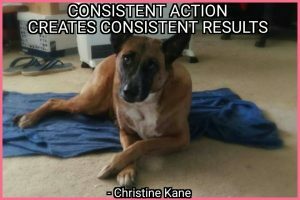 Dogs particularly thrive on consistency and routine. It can also lead to our pets “playing” us, if they learn what they can get away with with you, versus other family members. For example, a dog allowed on the couch with one person, is more likely to get on the couch when alone – while a dog never allowed on the couch (and taught an acceptable alternative consistently) will be less likely to get on the couch at all. 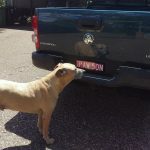 Especially when working on problem behaviours or training a new behaviour, our consistency with training what is acceptable and laying good foundations will better set your pets up for success. We must be consistent in understanding the outcomes we want, consistent in our approach, and consistent in our own behaviour. Call me, I can help. Is my dog trying to dominate me? Just say no to on-leash greetings? Marcia Davey on OMG that dog is wearing a muzzle! Margaret Sewell on OMG that dog is wearing a muzzle!